Nissan is seeking companies running EVs to take part in Vehicle-to-Grid technology trials as it pushes ahead with installing the technology in its own facilities. The carmaker’s UK-based European R&D facility, Nissan Technical Centre Europe (NTCE), has become the first Nissan facility to deploy the technology in line with plans to roll it out at all its major facilities in Europe. 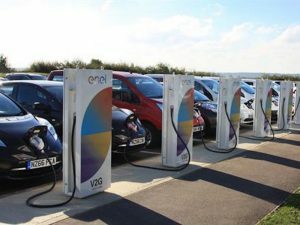 Developed by Nissan in partnership with multinational energy provider Enel, eight V2G chargers have been installed at the site and will be available for all NTCE employees to use. David Moss, vice president, vehicle design & development, NTCE, said integrating the technology into its own facilities “demonstrates the confidence we have in the technology and our steadfast belief that our electric vehicles can play a pivotal role in developing an ecosystem of technologies that work seamlessly together to create sustainable and efficient solutions for the future”. In August Nissan and Enel announced their first commercial V2G customer in Europe. Danish utility company, Frederiksberg Forsyning, has deployed 10 V2G units from Enel at its headquarters, making it the first business to commercially integrate and host the units.